National Service Scheme (NSS) The NSS aims at academic expansion and personality development of students through community service. It works as a link between institution and community. To develop a sense of social and civic responsibility, It inculcates the group living and sharing, leadership qualities and democratic attitude. To develop the capacity to meet emergencies and natural disasters and practice national integration and social harmony. It reflects the essence of democratic living and upholds need for selfless service and appreciation of other persons point of view and also shows consideration for fellow human beings. Welfare of the individual is ultimately dependent on the welfare of the socialy as a whole. Our college has 3 NSS units of 100 volunteers each, 314 students enrolled as NSS volunteers during the session 2010-11. In addition to the routine activities, the NSS organised various activities throughout the year not only at their own level but also with the various NGO of the city. 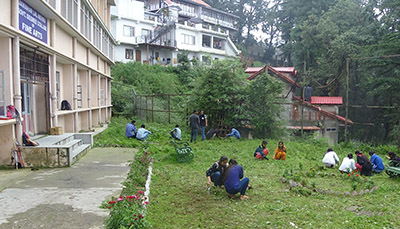 The NSS volunteers are also involved in the campus developments such as lying of gardens, tree plantation in the premises, awareness on drug abuse, AIDS, populationo education and other such projects, about 30 hours in a year are allocated for these projects. eradication of illiteracy, watershed management, environment protection, drug, AIDS awareness, hygiene, sanitation, gender justice etc. Under this, camps of 7 days duration are organised in the adopted villages/urban slums during vacation with some specific projects by involving local communities. 30-50 % NSS volunteers are expected to participate in these camps. Apart from these activitiies, some NSS volunteers are also selected for the national camps, such as Republic Day parade, National Adventure camps, National Summer mega camps etc.